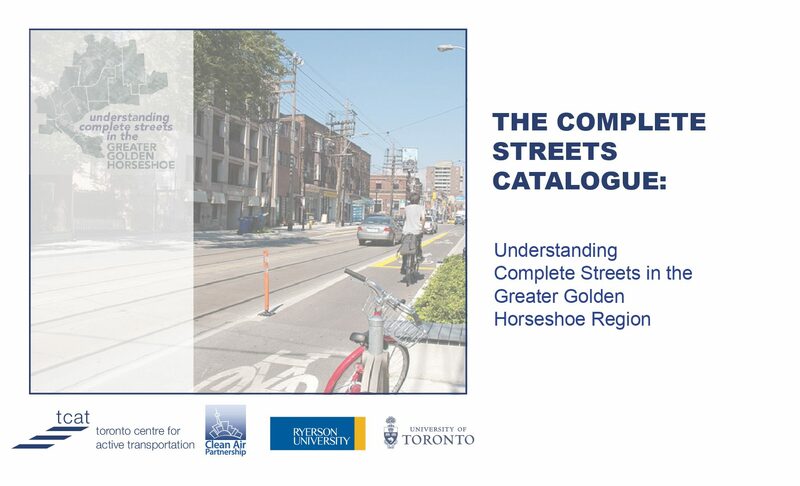 The Complete Streets Catalogue: Understanding Complete Streets in the Greater Golden Horseshoe Region features projects from 19 municipalities that reflect the diversity of Complete Streets approaches being implemented by municipalities across the region. The catalogue was produced during the first phase of a research project funded by the Places to Grow Implementation Fund. Between 2014-2015, The Centre for Active Transportation (TCAT) worked with Dr. Raktim Mitra at Ryerson University and Dr. Paul Hess at the University of Toronto to develop tools aimed at improving the capacity of GGH municipalities to plan and evaluate transportation infrastructure, particularly around active transportation. In the second phase of the research, the team produced a companion resource – the Complete Streets Evaluation Tool. The catalogue was released on December 18, 2014 (and again, with minor updates, on January 26, 2015, and March 16, 2015) and is available both online (available here), and as a PDF print version (below).